Light & Darkness Radio: Featured Today! "Noekk, Summoning..."
Working hard to give you the best, the new, the Indie and the classic! As you know L&DR is growing very fast and is all Thanks to you for listening and supporting one of the best stations of the Live365 network (users feedback) with a HUGE variety of the best music genre in the world METAL! Up the irons!! Here's Today Featured Bands! Noekk (DE) - Born from the ashes of dark metal band EMPYRIUM, NOEKK features multi-instrumentalists Funghus Baldachin and F.F. Yugoth who used to go by the respective names of Ulf Theodor Schwadorf (alias Markus Stock) and Thomas Helm. Unlike their old incarnation, NOEKK are not a metal band even if their style has the same dark, brooding atmosphere, starting with their own name (NOEKK was a ghastly fairy-tale creature who would lure young men, women and children into the abyss). Their style is really not easy to pin down, so I'll let Baldachin, who is more or less in charge of things, describe it to you: "NOEKK is free and boundless rock music taking inspiration from Nature's magic and putting it into sounds without constraints. Calm at first, then hurrying, then revelling in pathos - but always with an eye on the abyss". Their only album todate, "The Water Sprite", is their contribution to prog. Full of atmospheric doom yet strangely alluring, it opens with soft piano arpeggios that herald a peaceful walk through nature, then suddenly delivers a sonic blow in an avalanche of instrumental frenzy before retreating into itself again. Extremely moody, it exudes a mysticism and gloomy melencholy not unlike ÄNGLAGÅRD or LANDBERK and, to a certain extent, KING CRIMSON for the keyboard work. The lyrics are appropriately serious and profound (one of the tracks, btw. is penned J.R.R. Tolkien). Experimental, moody, intriguing. May be too quiet for the hard-core metalhead but will certainly inspire other prog-metal lovers as well as progheads with a particular taste for the dark side of life. Summoning (AU) - Summoning was formed sometime in 1993 by Silenius (Michael Gregor), Protector (Richard Lederer) and Trifixion (Alexander Trondl). Before creating Summoning, Protector was playing drums in a thrash/death metal band called Marlignom and had embarked on a four year study of drums in music school. Silenius was in a doom metal band Shadow Vale (at 16 years old) and had a few years in music school studying piano. Before Summoning, Silenius was making music, together with Pazuzu (Ray Wells) in a band Cromm. Trifixion played in the bandPervertum. Summoning recorded two demos (Upon the Viking's Stallion and Anno Mortiri Domini), as well as a split with the Austrian band Pazuzu (The Urilia Text) and a five-track promo tape for Lugburz. Nearly all songs from the demos were never released after or took place on CDs in a very different version. The demos sold quite well in a record shop in Vienna, called "Why not". Some time later Silenius got in contact with T.T. (Thomas Tannenberger), eventually leading to the birth of Abigor. Silenius ended up doing all vocals for Abigor releases (except the demos) as a permanent member until 1999. 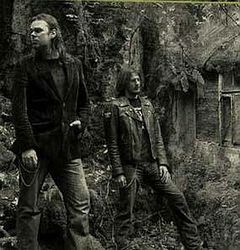 The first Abigor album was recorded for the young Napalm Records label, which led to Silenius managing to get a deal from Napalm for Summoning's debut Lugburz in 1995. At that time the members of Summoning were: Silenius - vocals, keyboards, bass; Protector - vocals, keyboards, guitar; Trifixion - drums (his last release with the band); Pazuzu lent some additional vocals and wrote some of the lyrics. Lugburz was more traditional black metal and very different from the band's later releases that would follow. The band continued as a duo after the departure of Trifixion, releasing Minas Morgul in 1995. This was the band's first release in their new style, an epic and atmospheric style utilizing guitar purely as a background instrument and synth almost as a lead, using re-recorded early songs. Dol Guldur, in 1996, continued this style and saw an influence from Protector's darkwave project Ice Ages. It also credits J.R.R. Tolkien for lyrics. In 1997, the Nightshade Forests EP was released, and has since been included on the recent Dol Guldur pressings . After this, the band ceased all work for nearly two years, and also stopped work with many of their other music projects. But in 1999, Summoning returned withStronghold which, while still in the classic Summoning style, focused more on guitar work to create melodic lines rather than keyboards and synthesizers than in previous releases. In the year 2001 the follow-up Let Mortal Heroes Sing Your Fame was released. This release was a kind of combination between the old and new style of Summoning, with the keyboard lines being more epic and polyphonic while the guitars bore a similarity with the more complex and rock-esque guitar-style from Stronghold. This time the band used more spoken-word samples to bring a more dramatic style to the songs and for the first time the band works with clear vocal choirs on the song Farewell. The lyrical concept again was totally based on Tolkien's Middle-Earth, but for the first time it was combined with some inspiration from Michael Moorcock's fantasy writings. In 2003, they released the Lost TalesEP, which consisted of leftovers from the Dol Guldur sessions. 2006 saw the release of Oath Bound, which consisted of all new material. The long break between the latest two albums was due to struggles in the band members personal lives, along with lack of ideas. This album featured a "relaxed arpeggio style" guitar sound, which the gave a more epic feeling to the sound. They also had better equipment available to them for this album and were able to create greater choir vocals than they had done before. A 4-song mini CD was suggested for release in 2007 containing at least one song which didn't make it onto Oath Bound due to size issues. However, this idea has been abandoned and Protector has begun work on music for a full-length release, while waiting for Silenius to finish recording the next Kreuzweg Ost album.